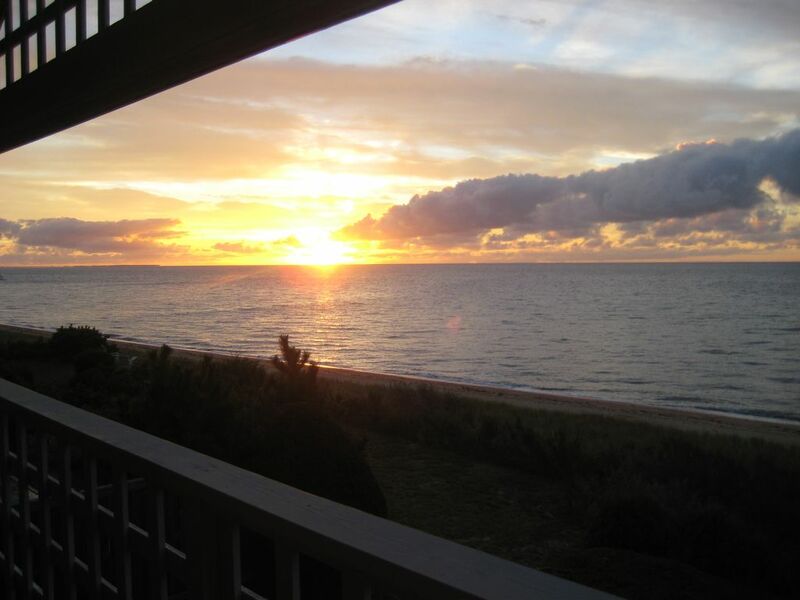 Our beachfront home offers all you need for a quintessential Cape Cod vacation. Sleeping between 8 and 10 (converted sunporch can act as a 5th bedroom with a twin over full bunkbed with trundle) and offering 3 bathrooms, our home is geared for families. With the private beach just steps away, there is no need to undertake a daylong trip to the beach - come and go as you please! Had enough sun for the day? Walk just one block to the Marketplace where you will find several eating options (including the well known Raw Bar, which offers the lobster roll of a lifetime! ), an ice cream store, minigolf and summer music concerts on the weekend. For the shoppers, Mashpee Commons offers a huge selection of fantastic shopping for those who can tear themselves away from the beach. Incredible ocean view, direct access to private beach, scenic view from private patio and balcony off master suite. The home is spacious and well kept. It has everything you need to enjoy a true Cape vacation. The home, patio, private beach and easy walk to Popponesset Inn and Marketplace make this an ideal place for a relaxing vacation. We chose this home for a family vacation and couldn't have been more pleased and satisfied with this lovely place. Being right on the ocean was the main attraction and having the Marketplace within walking/biking distance was another big plus. The house is roomy, well laid out, the dining area both inside and out on the terrace has plenty of room for large gatherings. The kids bunk room on the main floor with its private entrance turned out to be the perfect place for me (the matriarch). Although we left the property to go sailing and to Monomoy Island, most of the time we were more than happy to just stay put and enjoy the perfect location. We really hope to be able to rent this property again, and I would definitely recommend it to friends and/or relatives. Our Cape Cod home is located just steps from a private beach (a true waterfront property) shared only by a one block association of residents. The beach is just a few steps down the path from the edge of our patio, where you can sit and enjoy the beautiful sunsets over the ocean. Just a block away is the Popponesset Marketplace that offers several eating options, an ice-cream store, minigolf, and the well known Raw Bar. Music concerts take place on the weekends during the summer months. Just a five minute drive away is Mashpee Commons which offers wonderful shopping for those who can tear themselves away from the idyllic beach. A Roche Bros. grocery store is also a five minute drive away.